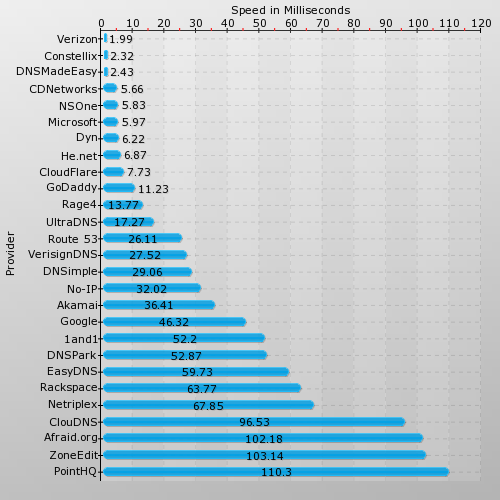 Last month, Tiggee subsidiaries DNS Made Easy and Constellix were ranked in the top three for fastest DNS providers. Constellix finished the month with an average 2.32 milliseconds response time with DNS Made Easy following with a close 2.43 milliseconds. This marks the eighteenth consecutive month that DNS Made Easy has been in the top three. In both 2016 and 2017, DNS Made Easy was overall the fastest vendor and in September, DNS Made Easy celebrated twelve months as the fastest provider. “Our industry leading speeds are a direct result of our commitment to invest in our network. Every year, we invest over ninety percent of our revenue back into our network,” says Founder of DNS Made Easy and Constellix Steven Job. SolveDNS is a network monitoring firm that ranks to top providers every month based on the response times gathered from seven geographically unique nodes located at crucial internet exchange points. DNS Made Easy continues to rank third for market share, serving top clients in SaaS, ecommerce, and advertising. DNS Made Easy serves queries for over 900,000 domains and answers 40 billion queries daily. DNS Made Easy is a subsidiary of Tiggee, and is a world leader in providing global IP Anycast enterprise DNS services. DNS Made Easy implemented the industry’s first triple independent Anycast cloud architecture for maximum DNS speed and DNS redundancy. Originally launched in 2002, DNS Made Easy’s services have grown to manage over 900,000 customer domains and answers more than 40 billion queries per day. Today, DNS Made Easy builds on a proud history of uptime and is the preferred DNS hosting choice for most major brands, especially companies that compare price and performance of enterprise IP Anycast alternatives.